They say that necessity is the mother of invention. In Colonial America, Patriot printer William Goddard found that the Crown Post, Britain’s colonial mail system, was blocking his Pennsylvania Chronicle newspaper from getting to his subscribers, as well as blocking important news he needed to include in the paper from getting to him. It was here that necessity birthed the ideas for a new postal system not run by Britain. In 1774, Goddard partnered with his friend and mentor, Ben Franklin, to propose a Colonial mail system to the Continental Congress. 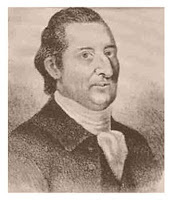 Franklin had served the Crown Post for a total of thirty-seven years, both as Philadelphia’s postmaster and as the joint postmaster general of the colonies. Franklin lobbied for Goddard’s ideas to be heard, and on October 5, 1774, Goddard gave his extensive designs to Congress. However, due to other pressing matters, they didn’t act upon the idea immediately. But Goddard did. Goddard began his mail service without the congress’s approval. His new system was run and paid for by subscription service. A private committee was elected by the subscribers, and was in charge of appointing postmasters, determining the mail routes, setting postal rates, and hiring post-riders. 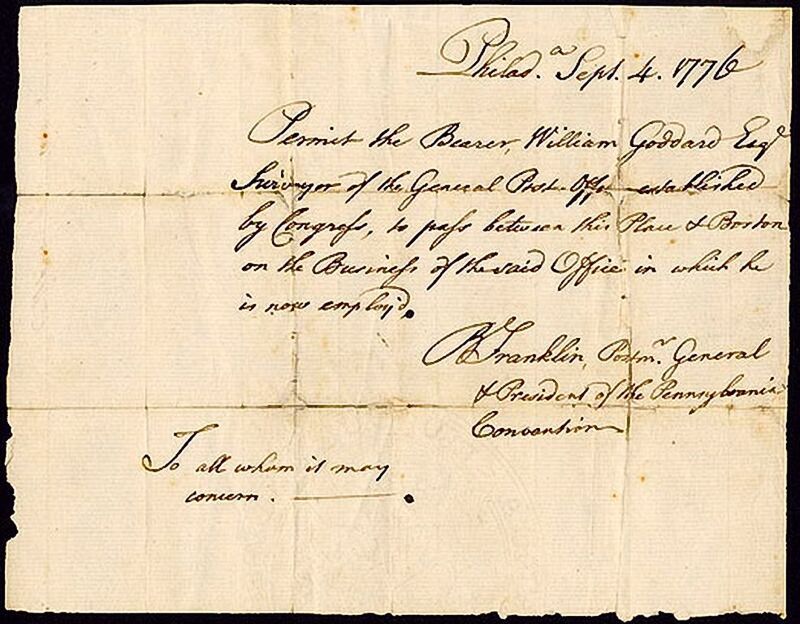 By the time the Continental Congress met in May of 1775, Goddard’s Continental Post had 30 post offices between Portsmouth, New Hampshire, and Williamsburg, Pennsylvania. Each post rider was made to swear that he would keep all mailings under lock and key. On July 26, 1775, the Continental Congress put their approval on the new postal system. ToGoddard’s chagrin, the congress named Benjamin Franklin as the first Postmaster General. They did, however, grant Goddard the position of Riding Surveyor. 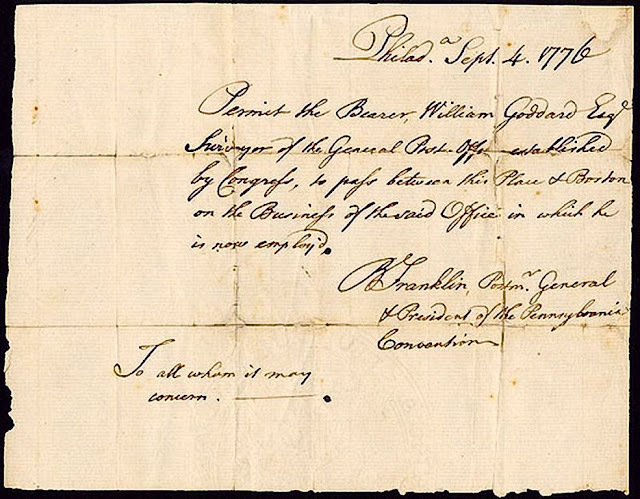 Franklin drew up a hand-written pass for Goddard, allowing him to travel at his discretion for the surveyor position. Within his new job, Goddard traveled southward to set up new post offices. Because of this, the colonists quickly switched their mailings to the Constitutional Post, and by Christmas Day 1775, the Crown Post was forced out of business. Franklin stayed on as Postmaster General until November 7, 1776. 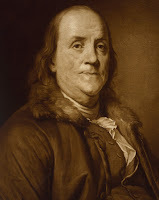 Since the Declaration of Independence was signed on July 4 of that year, Franklin is stated to be the first Postmaster General of the United States. After Franklin’s departure, Goddard hoped for the appointment to the Postmaster’s job, but was again passed over. This time, it went to Franklin’s son-in-law, Richard Bache. At this point, Goddard resigned to pursue other endeavors. While many credit Franklin as being the creator of the U.S. Postal Service, it truly was Goddard’s invention, born out of the necessity of getting his newspapers into the hands of the colonists, which brought about the postal service as we know it today. Tomorrow marks the 240th anniversary of the service. 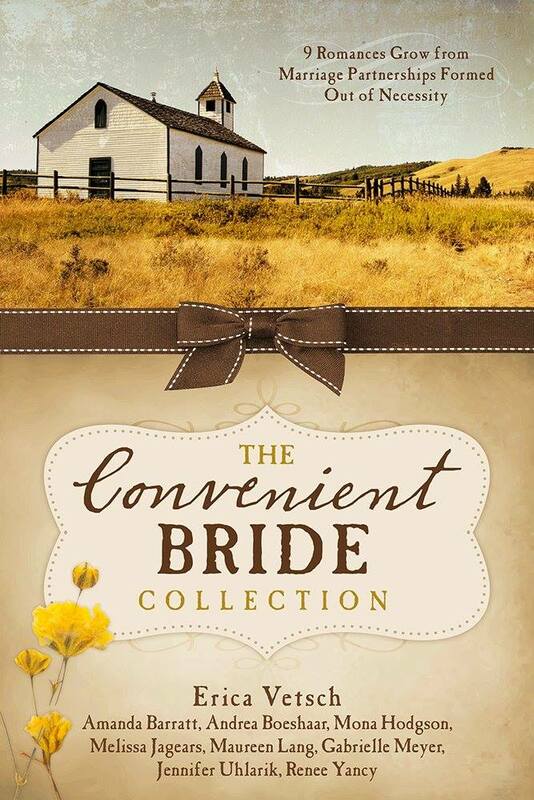 Why not make an effort to thank your postal worker when he or she comes by. I enjoyed reading about the birth of the U.S. Postal Service, Jennifer. It seems as if Goddard took his life in stride after all. I do think Goddard tried to be mature about the constant snubs, Rebecca. I'm sorry the man didn't get the credit he was due. Great info. 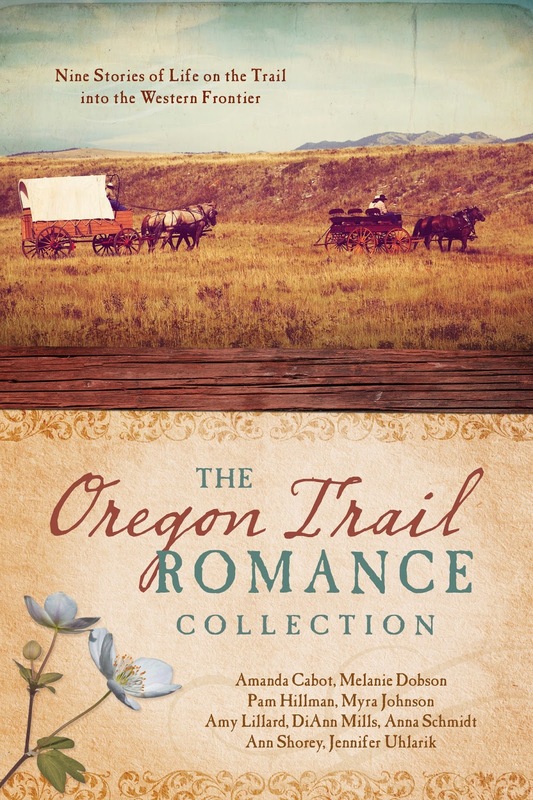 I have read the Oregon trail romance 9 great stories. What a great post, Jennifer. It's so sad that I've never heard of Goddard. I hope he went on to find something satisfying and rewarding to do. Thanks for the new information. Thank you, Michele. I hope he did also! I think you're right, Sharon. Without Ben Franklin, the project may not have gotten off the ground. 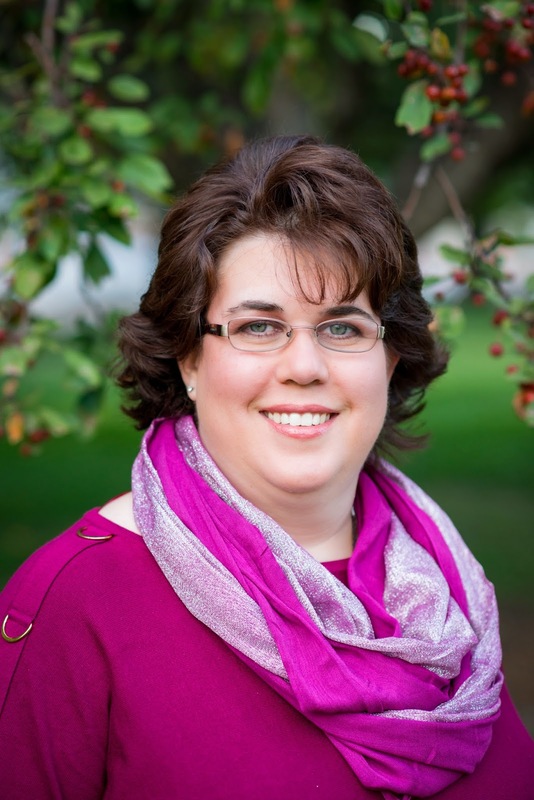 Thank you for your most interesting post, Jennifer! So glad you enjoyed it, Melanie! Thank you for stopping by and commenting.